With old ground The Dell not fit for purpose as far as Premier League football is concerned, construction of St Mary’s started late in 1999 and was completed at a very reasonable cost of £32million in summer 2001. The Saints played their first game here in August 1st, 2001 against Espanyol. 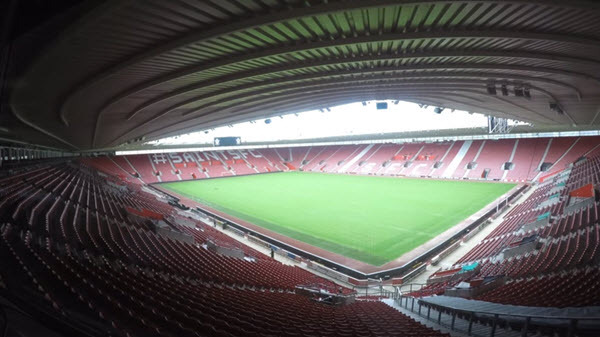 St Mary’s Stadium is a complete bowl with all stands of equal height, something which would have to change if the club ever found the need to expand. Two large screens are placed at opposite ends of the ground and can be seen from every seat. Strangely, St Mary’s is the largest football stadium in the south of England outside of London at over 32,000 capacity. Naturally undersoil heating is utilised at St Mary’s, although there is a reasonably mild climate on the south coast, while the playing surface is a mix of natural grass and synthetic fibres and measures the standard 105 metres by 68 metres. The current capacity at St Mary’s is 32,500 and is unlikely to change in the near future. The four main areas of St Mary’s Stadium are the Northam Stand to the north behind the goal, opposite is the Chapel Stand. The Itchen and Kingsland Stands run along the length of the pitch. All four corners are filled with the family areas in the south and the Itchen, Northam and Kingsland Stands joined at the other end. Away fans are housed at the northern end of the ground within the Northam Stand which is shared with home supporters making the atmosphere noisy. Typical Premier League ticket allocations are just over 3,000 though this will change for cup games etc when as many as 4,500 can be handed to the opposing side. A wide range of pricing exists at St Mary’s for Premier League tickets depending on age, location within the stadium, time of year and of course the perceived level of opposition. Pricing is split into Category A and Category B, the prices for the latter ranging from £32 – £46 and the former from £39 – £52 for an adult. ‘Club Southampton’ matchday hospitality packages are offered up with a wide variety of premium experiences in Executive Boxes, the Terry Paine Lounge, the President’s Lounge and the Saints Bar. Prices range from £138 – £180 per person plus VAT in most lounges while the executive boxes generally run from £175 – £195 for most Premier League games. Drivers heading to St Mary’s can take the M3 motorway then the A33 into Southampton. When reaching the A3024 Northam Road, look for the B3038 (Britannia Road) to reach the stadium. Parking is sparse at the stadium however and driving there on matchdays is not recommended for any supporters with traffic heavy. The best way to reach St Mary’s is by train with the stadium around 1½ miles from Southampton Central Station, around a 30-minute walk. Shuttle buses are in operation on matchdays from the station too, taking supporters right to the stadium. As far back as 2012 there were ambitious plans to expand St Mary’s to a 50,000-seat stadium though that seems very unlikely to happen. Without consistent top-six and European football the demand will simply not exist within the town to fill such a stadium and so things will remain as they are for now.